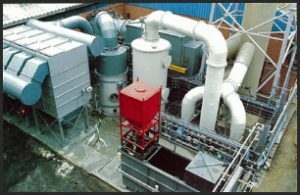 Venturi Scrubbers - BORN Inc.
Venturis accomplish liquid/gas contacting by accelerating a mixture of the gas and liquid through a throat at high velocity, hence, they accomplish instant temperature quenching of the gas to its saturation temperature. The saturation temperature for flue gases is typically between 150 and 170 degrees F. Venturis do require a pressure drop to operate. The higher the pressure drop, the better the scrubbing efficiency. Typically the pressure drop in a venturi is 25 to 50 cm w.c.. The gas can be motivated by a forced draft or induced draft fan to overcome this requirement if needed. The circulating liquid can be water, dilute caustic or any solvent. Removal efficiencies of acid gases from flue gases can be as high as 90%, depending on the pH of the circulating liquid, the amount of strong vs. weak acids entering the system, and the amount of free anion available in the circulating liquid, and the pressure drop available for the venturi. Particulates are removed in venturis by the wetting action of the solvent with the particulate as they accelerate through the venturi throat. Venturis are generally contructed of metal for rigidity. The whole spectrum of alloy steels, or lined steels can be used depending on the application. Venturi scrubbers can provide very economical solutions to tough waste gas scrubbing problems.